Michael Pineda technically has a pitch repertoire that consists of five pitches; a four-seamer, two-seamer, changeup, slider and cutter. In reality — when we look at the usage of these pitch types — Pineda only throws two pitches. As you can see from the table below he throws his four-seam fastball and slider 75 percent of the time. Important Note: The pitch types are listed according to PITCHf/x classifications. Brooks Baseball shows Pineda throws more of a cut-fastball then a four-seamer. In this analysis, I extracted the cut-fastball’s based on their increased horizontal movement and left the one’s with less movement as four-seamers. My reasoning is that even if he is trying to throw a cutter, if it doesn’t move much it is being viewed by the batter as more of a four-seam fastball. Since Pineda mainly only throws the four-seamer and the slider, the batter typically only has to concern himself with two pitches. This is not necessarily a bad trait as long as he has overpowering stuff. 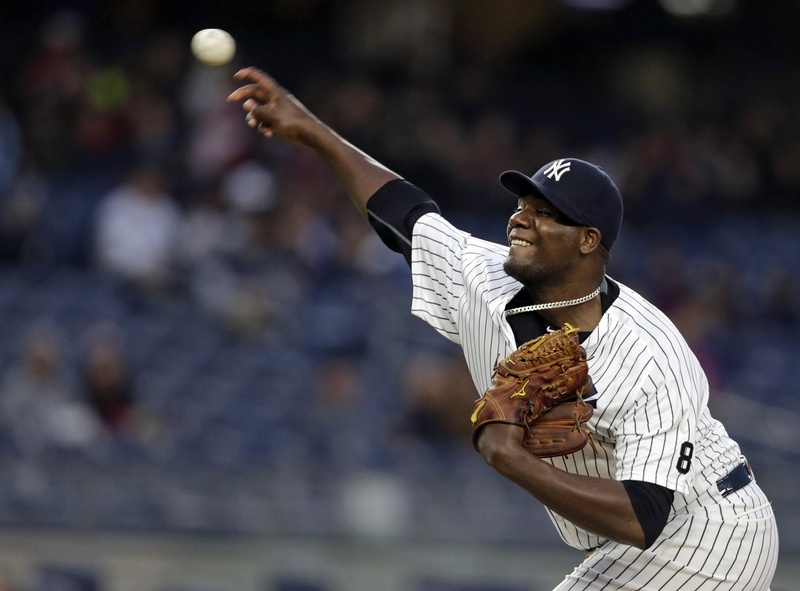 The question then becomes, does Michael Pineda have overpowering stuff? The answer is more complicated than a simple yes or no. Yes, Pineda throws hard. In fact, his average four-seam fastball velocity ranks 26th amongst qualified starting pitchers according to 2016 PITCHf/x data (Side note: there are around 25 starting pitchers with a fastball only one mph less than Pineda’s 92.8 mph four-seamer). Yes, his slider is nasty. Its average velocity ranks 34th amongst qualified starters and the horizontal and vertical movement of the pitch is well above league average. On paper it would seem his main pitches could overwhelm batters, but the optics do not always bear the resemblance. As Nicolas Stellini pointed out in this game recap from April 24, 2016, Pineda can miss – especially with his fastball – right down the center of the plate. Any major-league level hitter and even most Triple-A players would be able to handle that pitch quite often. While Pineda has some execution issues when it comes to throwing his pitches he has shown flashes of success as Max Gelman pointed out in a previous article. 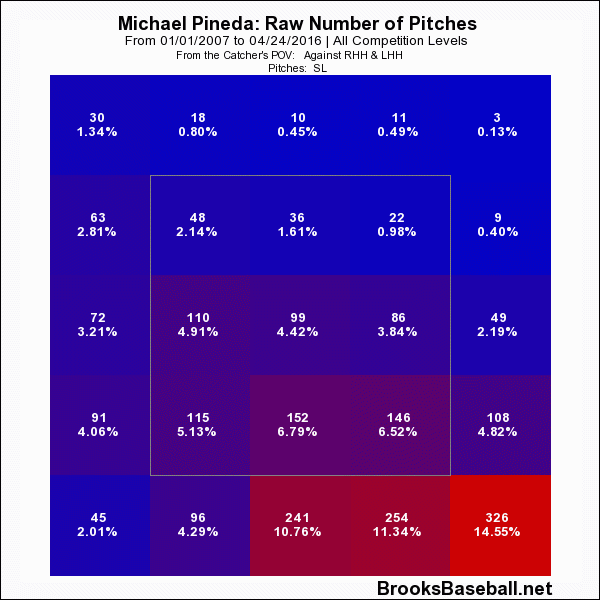 Getting back to the focal point of this examination, let’s look at how Pineda has seen success with mixing his pitch sequence. Review the matrix below which shows us the predicted probabilities of each one of Pineda’s pitch types based on the previous pitch thrown. For a player that relies so heavily on just two pitches Pineda does a pretty good job of blending them so that batters cannot anticipate the next pitch. As you can see, the most predictable pitches are the fastball and slider, but the probability of Pineda throwing one of those pitches based on his previously thrown pitch is nearly the same for each pitch type. In this respect, one could say Pineda is better than Masahiro Tanaka – the Yankees defacto ace – at being unpredictable especially considering Tanaka has a more extensive pitch weaponry (See analysis of Tanaka). However, as I mentioned in a similar post about Tanaka, the Yankee catchers might have just as much to do with pitch type selection and sequencing as the pitchers themselves. The pitcher is still ultimately responsible for his own success and failure so if a problem is caused by poor pitch sequencing it is up to the pitcher to make sure it is corrected. If we look at Pineda’s first pitch offerings we get a glimpse of one pitch that might be predictable. He throws the fastball for the first pitch 48.4 percent of the time going back to the beginning of the 2015 season. If you include the cutter in the “fastball” class that number moves up to around 65 percent. Needless to say, opposing teams with this information are relaying to their hitters to look for first pitch fastballs when facing Pineda. The only other pitch type that I can see that might allow a batter to foresee Pineda’s next pitch is the changeup. Pineda doesn’t throw the changeup that often – about 11.5 percent of the time – but when he does the model predicts with a probability of 43.8 percent that the next pitch will be a slider. Granted, there is a 33 percent chance it will be a fastball, but it is basically the only pitch – besides the first pitch fastball – that leads to any decent measure of predictability. If a batter where to see the changeup and afterword still maintains an advantage in the count he might consider taking the next pitch. He would take knowing the next pitch has a solid chance of being a slider and that Pineda rarely throws the slider for a strike. At the beginning of my analysis I thought that Pineda would be more predictable than most pitchers because he really only uses two pitches. Now it is clear that my mind was playing tricks on me. Going forward, my hypothesis – with regards to analyzing the predictability of other pitchers – is that the more types of pitches a pitcher throws the more likely it is to find sequences of predictability.